The Jerry Springer Show, starring Randy, Jerry, Brett, and Donovan. Before the games last Sunday morning, cable and network mainstream NFL broadcast coverage may have reached an all time low. So Randy Moss is on his third team in about a month. With all the attention given to Jerry Jones and the Cowboys, one would think they were the first team in league history to start 1-7. Favre: the weekly saga. And Donovan McNabb’s situation in the nation’s capital; the quarterback was strangely benched a few weeks ago in the last two minutes, for what his coach said was, “cardiovascular conditioning”. All The NFL’s Children The Talking Heads on each channel reiterated themselves about these subjects, over and over again. None had anything original or substantive to say. It was as if there no games on the field that day. Mute button was mandatory control equipment, even power off. At the end of the regular season, when it counts, with the possible exception of the Titans, the teams of the characters hackneyed all day, the Cowboys, Vikings, and Redskins, will be nowhere to be found. Championship Wrestling, II. Was there any actual football coverage? Even though they had a bye, did anybody remotely analyze just how the Oakland Raiders have suddenly become a threat to win the AFC West, or how woebegone Cleveland managed to handily knock off the Saints and Patriots in consecutive weeks? (All I saw was a clip of Jets coach Rex Ryan mimicking his brother on the Browns staff – with a wig – in anticipation of their match-up later that afternoon). Personality pomp and water cooler fodder are part of the NFL’s and any sport’s patronage, but the lopsided ratio of fluff over substance was below the belt last weekend. Way down there. Not Peyton’s Place Coming into the weekend’s games, the networks didn’t pay attention to who the highest rated (about a 105) quarterback in the league was – not Peyton Manning, Drew Brees, or Tom Brady, but one – Michael Vick, of the Eagles. On Monday night, when his dizzying array of talent initiated a record slaughter of McNabb’s wimpy Redskins (35-0 at the start of the second quarter), it was as if the mass media were caught red-handed staying out after lunch and drinking all day, clueless about what was really going on in the NFL. Nobody’s Fool In Philadelphia a year ago, the Eagles didn’t fool anybody on Souls Of The Saints about signing Michael Vick for humanitarian purposes. Coach Andy Reid clearly felt Donovan McNabb’s erratic play had peaked in his usefulness to their club. The job would be Vick’s to earn, taking time to round into form after an extended absence, away from the media spotlight as much as possible, and last but not least, at a relatively low base salary with a short term commitment, to see if it would work. Reid mention earlier this season that the Eagles were alternate “Kevin Kolb’s team” was garbage bluff. We saw the best results Monday night, on the opening play from scrimmage, when Vick faded back and pressed a button, a pass almost 60 yards in the air, right to the outstretched hands of a receiver that was almost overthrown. Vick does not look quite as quick as he used to be (who is? ), but he is plenty fast enough to tire defenses with his feet. Now, Vick’s next audible should be hiring Donovan McNabb’s agent. The Price Isn’t Right Washington has a history of often having the wrong people in office, and earlier on Monday, the Redskins inexplicably locked up an aging (34), marginally overweight McNabb, who hasn’t put together a great season in quite some time, to a big bucks, long term contract, as if he were some sort of franchise savior. It came out that the Redskins had a cut clause removing them from big guarantees, but a hefty pay raise for – what? – was a coup de gras for the signal caller. McNabb’s agent is, hands down, Salesman Of The Year. The score of the effective one year quarterback exchange for the two teams in the NFC East the other night really was, thirty five zip. 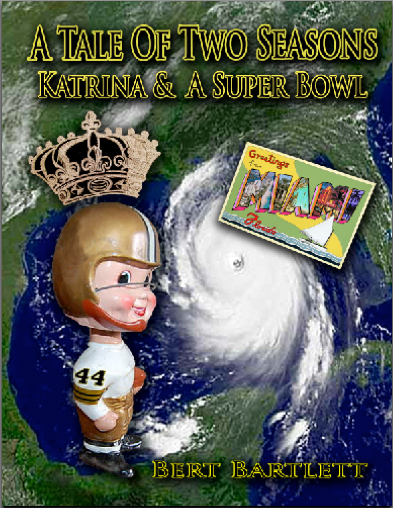 Somewhere, Over The Rainbow For the most part, as the season commences its stretch run, staying above the mass media urinals, and mostly below their radar screens, are the New Orleans Saints. The suds of Reggie Bush’s Heisman woes have been passed on to Auburn’s star quarterback. Promisingly, their defense is as physical as the days of the Dome Patrol and can stop people, as opposed to just getting turnovers. Their offense has struggled, but there is time to work out the kinks, Brees’ left knee should be mending, and Bush returns, at least as a threat this week, when another set of birds, the Seahawks, fly into town. Though they lead their division, the Little Sisters Of The Poor that is the NFC West, it’s hard to get a read on Seattle. The Saints don’t see them very often. Former USC coach Pete Carroll took their head coaching job this season, eluding the grasp of the NCAA, before they came wanting for Reggie’s trophy, from violations when they were both there competing for national titles. Carroll’s current roster is loaded with no names, which is hardly a bad thing. QB Matt Hasselbeck is older and has been injury prone, but has been effective, bringing the ‘Hawks to the Super Bowl not that many years ago. On defense, linebacker Lofa Tatupu, also of USC, is a smallish but active playmaker. The Seahawks have usually been a lousy road team of late, when not in the confines of owner Paul Allen’s (formerly of Microsoft) glitzy new stadium, which has created pro ball’s version of the Twelfth Man. All one can seemingly bank on out there is drizzly rain and lots of coffee to help offset the malaise. It will be interesting to see not only the invaders, but how the Home Team looks this week, as the margin for error is shrinking in the logjam that is the rest of the conference. Atlanta is the front runner at 7-2, and Chicago, Green Bay, Philadelphia’s Vick, the New York Giants, and even still Tampa Bay, are all swamped with New Orleans at 6-3. Yet only one of those teams remains defending champs, until they are knocked off. That is the good news, particularly as more injured players make their way back from General Hospital. But Hush Hush, Sweet Charlotte, don’t tell the mass media. ‘Dat could spoil it.